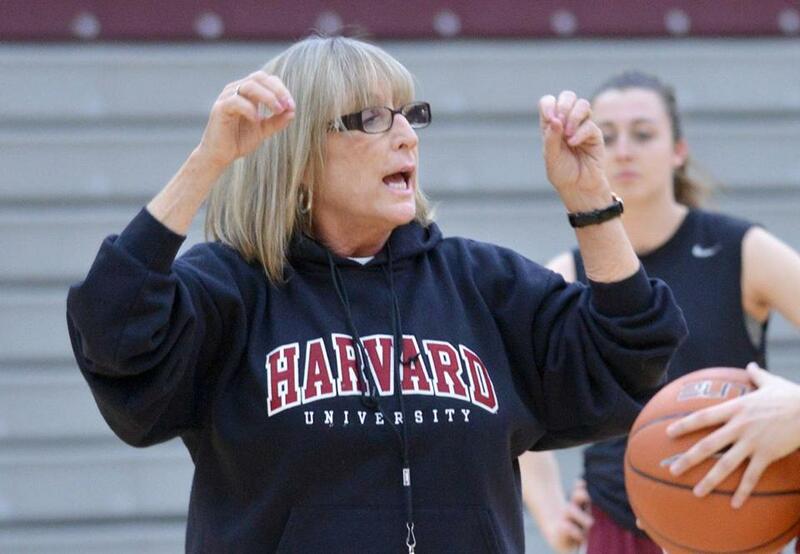 Harvard coach Kathy Delaney Smith. Coach: Erik Johnson (sixth season, 61-92). 2016-17 record: 9-21 (2-14 ACC). Probable starters: G Rachel Gartner (2.1 ppg), G Taylor Ortlepp (7.3 ppg), F Georgia Pineau (7.5 ppg), F Emma Guy (5.7 ppg), G Andie Anastos (NA). Key reserves: F Milan Bolden-Morris (NA), C Katie Quandt (4.4 ppg). Outlook: There are a lot of new, young faces for the Eagles. Coming back from injury, Ortlepp was a key part of the offense and will be looked upon for that again. Freshman Bolden-Morris and graduate student Anastos (who played hockey at BC for four years) will play important roles. Coach: Katy Steding (fourth season, 13-68). 2016-17 record: 13-16 (11-7 Patriot League). Probable starters: G Corrine Williams (8.1 ppg), G Payton Hauck (3.0 ppg), F Nia Irving (7.2 ppg), F Naiyah Thompson (6.0 ppg), C Sophie Beaudry (12.9 ppg). Key reserves: F Kara Sheftic (5.4 ppg), G Lauren Spearman (1.2 ppg). Outlook: The Terriers saw a huge turnaround last season, posting their most wins in league play since 2013, when they joined the Patriot. Beaudry & Co. will try to maintain that upward trajectory. Coach: Kathy Delaney-Smith (36th season, 567-384). 2016-17 record: 21-9 (8-6 Ivy League). Probable starters: G Katie Benzan (13.4 ppg), G Madeline Raster (10.6 ppg), G Taylor Rooks (5.9 ppg), G Kirby Porter (2.6 ppg), F Jeannie Boehm (7.2 ppg). Key reserves: G Sydney Skinner (8.5 ppg), G Nani Redford (2.9 ppg). Outlook: The Crimson reached the second round of the WNIT last year, the program’s 13th appearance in the postseason. With returning cocaptains Porter and Raster, along with local talent Benzan (Wellesley), another tournament appearance could be in store. Coach: Tory Verdi (second season, 9-21). 2016-17 record: 9-21 (3-13 Atlantic 10). Probable starters: G Leah McDerment (6.2 ppg), G Jessica George (2.7 ppg), F Genesis Rivera (12.7 ppg), G/F Hailey Leidel (15.5 ppg), C Maggie Mulligan (13.9 ppg). Key reserves: G Vashnie Perry (5.2 ppg), F Alexia Allesch (NA). Outlook: The Minutewomen ended last season on an 11-game losing streak. To turn things around in Verdi’s second year, they will need scoring from Mulligan and Leidel, plus production from the five freshmen on the squad. Coach: Kelly Cole (fourth season, 31-60). 2016-17 record: 12-19 (8-10 CAA). Probable starters: G Claudio Ortiz (13.0 ppg), G Jess Genco (9.8 ppg), G Zoe Zwerling (4.3 ppg), F Gabby Giacone (7.3 ppg), F Maureen Taggart (4.7 ppg). Key reserves: F Loren Lassiter (2.2 ppg), G Te’Erica Eason (3.6 ppg). Outlook: Ortiz and Genco are projected as one of the CAA’s best backcourts; both were named to the preseason all-conference team. But if the Huskies want to improve on a disappointing 2016-17 campaign, other players need to produce. A tough schedule to open the season doesn’t bode well.